Dogs truly are man’s best friend. Yet when left alone – even for a short period of time – some dogs can develop the most common form of canine anxiety, called separation anxiety. Anxiety is a natural response from all intelligent animals, and dogs are no exception. Evolution has imprinted each living organism with a mechanism to cope with anticipated or unforeseen dangers. That mechanism is called anxiety. Treating dog anxiety can be a frustrating, seemingly no-end-in-sight process. 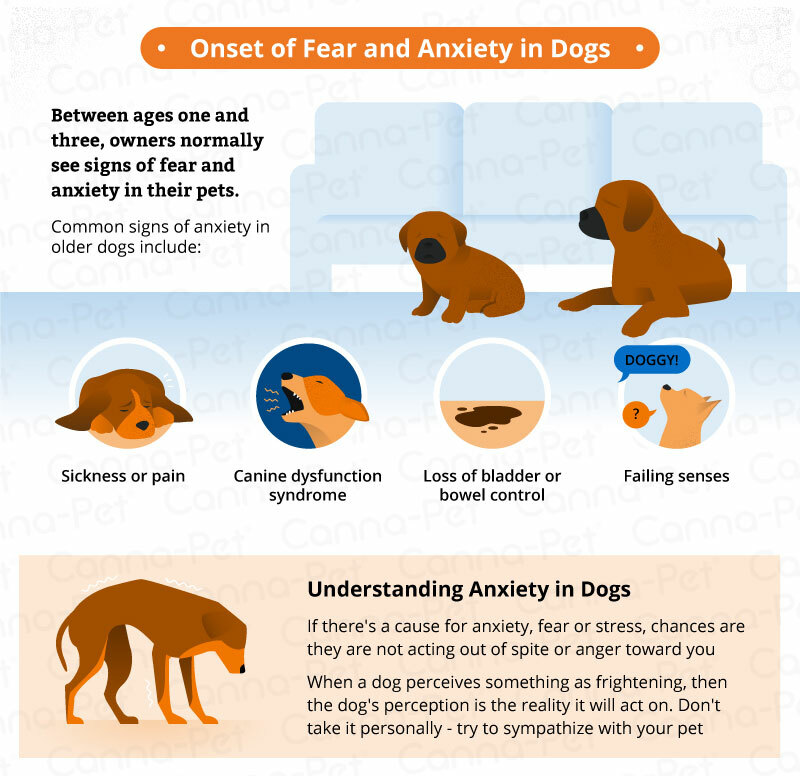 Let’s look at some of the most common kinds of anxiety symptoms in dogs, and also some different dog anxiety treatments. What are the primary causes of dog anxiety? Oftentimes, an adult dog will show signs of anxiety due to diminished attention from its owner(s). Puppies are usually showered with extra attention and care, but as the dog reaches the full-grown state, the attention they are so used to receiving sometimes wanes. Dogs are naturally trusting and companionship-centered animals; the emotional roller coaster of 24/7 attention followed by neglect is oftentimes a primary cause of canine anxiety. Even cats, not known for their connection to humans, can experience anxiety when placed in similar scenarios. Fear is something that is inherently present in all animals, including dogs, humans, and the rest of the animal kingdom. This primal instinct can flare up in response to real threats or perceived ones. Whatever the animal in fear perceives—a person, a thing, or a situation—fear is what signals the brain to get ready for trouble. This, in turn, prompts the fight, flight, or freeze response. This response and its associated behaviors are how animals (and people) survive and are completely normal. However, whether these responses are appropriate depends almost entirely on context. For example, a fear response in the presence of an aggressive dog or a violent human is a sensible reaction for any dog to have. On the other hand, a fear response in the presence of all dogs or all new people is probably a learned response to stress and dangerous situations, which can affect a dog’s behavior in commonplace situations. A phobia is an extreme, lasting fear of something very specific. When you think of phobias you might imagine people who are afraid of spiders or heights, and while this is an accurate perception, remember that dogs can also have phobias that feel just as real. For example, some dogs are terrified during thunderstorms or during fireworks on the Fourth of July. Both of these are great examples of dogs suffering from phobias. Something called idiopathic fear can also be found in some dogs. This is an extreme fear that sometimes causes dogs to withdraw from people, places, and activities they used to (or should) love. Some breeds most likely to experience this problem include: Siberian Husky, German Shorthaired Pointer, Chesapeake Bay Retriever, Bernese Mountain Dog, Great Pyrenees, Border Collie, and Standard Poodle, among others. There appears to be a strong familial component, with the likelihood of a genetic influence. Most dog owners tend to see the first signs of serious fear and anxiety in their pets between ages one and three, when their dogs are starting to become socially mature. However, other timetables are present in more specific cases. For example, very extreme fears that result in withdrawal tend to appear earlier on in dogs who are around eight to ten months old. Anxiety can be thought of as a type of fear, complete with very specific causes and symptoms. When dogs and other animals (including humans) experience physiological responses when anticipating dangerous threats, it is considered anxiety. This is why your pet suffering from anxiety acts just like an animal faced with imminent danger: he or she barks or cries excessively, acts out destructively, and even loses control of his or her bladder and bowels. So, what causes these kinds of terrible reactions? Often deep-seated emotional and/or physical problems can cause anxiety. There are other triggers for anxiety, however, including: trauma, past and present; loneliness and lack of company; illnesses like infections, infectious diseases, and viruses; and issues within the nervous system. The bottom line is that anxiety in dogs can be caused by any number of problems and come with a range of symptoms from casual to severe. Regardless of the symptoms and causes that characterize your pet’s anxiety, it is important that the problem be taken seriously with prompt treatment and attention. Destructive behavior, from tearing up carpet, chewing shoes, clothes, papers, and other items, scratching furniture or walls, etc. Certain breeds of dog are more likely to experience anxiety than others. These breeds also suffer from anxiety that is more intense: Australian shepherd, Bichon frise, Border collie, Cocker spaniel, German shepherd, Greyhound, Standard and Miniature Poodle, and Vizsla. Not surprisingly, these breeds tend to exhibit a stronger attachment to their owners than other breeds. But it’s worth keeping in mind that any dog breed – no matter how aloof it appears on the surface – is subject to canine anxiety. All dogs, regardless of pedigree, will establish an emotional connection with their owners. If you notice any of these behaviors in your dog, it is wise to consult your veterinarian as soon as possible. Before concluding that your dog is, in fact, suffering from anxiety or fear, your vet will first want to rule out any other conditions that may be causing the symptoms, such as braid or thyroid disease. In addition, your vet may want to perform some blood tests in order to test for any toxic substances such as lead, that typically result in behaviors similar to those experienced by anxious dogs. There are multiple levels of fear and anxiety that dogs may experience, and each level has different symptoms. Those that cope with ongoing anxiety are likely to show signs of excessive biting and licking in the form of skin lesions as well as other indications of nervous self-harm. Mild fears may cause a dog to hide, act passive, slow down and stop participating in normal activities, shake, tuck his or her tail, and withdraw. When fear escalates and becomes panic, dogs are likely to attempt escape and experience motor activities that can be seriously injurious. Separation anxiety, in particular, is a unique problem that many dogs experience. Many behavioral problems seen in dogs can be attributed to lack of training or other problems, but in some cases they may actually be a sign of separation anxiety. The biggest indicator that “bad dog” behaviors are being triggered by separation anxiety is when behaviors linked to emotional distress are also present. Separation anxiety in dogs is triggered when the people to whom they are attached, usually their main owner or guardian, leaves. Typically, dogs will begin by barking and yelping right after their owner leaves, but may also become more destructive after being alone for longer periods of time by chewing, digging, urinating, and trying to escape. If you notice your dog has a pattern of acting unsettled, anxious, or depressed before you leave, this is definitely a sign that your dog is experiencing separation anxiety. Some people may confuse dogs with separation anxiety with bad training, but distress signals like drooling or trying to prevent his owner from leaving are clear signs of separation anxiety. The absence is perceived as a dangerous threat, and this triggers attempts at escape, which can leave the house in serious damage. This kind of destructive behavior is often centered around doors and windows, which the animal may perceive as “causing” the absence. Occasionally separation anxiety comes with the onset of old age as your pet’s cognitive processes, including memory, decline. Separation anxiety is the most common specific anxiety in companion dogs (American Eskimo Dog, Bichon Frise, Boston Terrier, Cavalier King Charles Spaniel, Chihuahua, French Bulldog, Italian Greyhound, Lhasa Apso, Maltese, Pomeranian, Yorkshire Terrier, Toy Fox Terrier, Tibetan Terrier, Tibetan Spaniel, Silky Terrier, Shih Tzu, Shiba Inu, Schipperke, Pekingese, Pug). When alone, the animal exhibits anxiety or excessive distress behaviors. A dog’s diet should not only include the vital nutrients and vitamins for strong bones, healthy teeth and a lush coat. It should also sustain and improve critical biological functions, including mood, appetite and memory. Optimal nutrition is extremely important for canine health, including your dog’s emotional well-being. However, it is important that you pair your dog’s healthy diet with regular exercise as well. Not only does rigorous exercise stimulate serotonin-production in the brain, but it also gets rid of pent-up energy that can fuel your dog’s anxiety. A short walk in the park or a game of fetch can work wonders when it comes to reducing stress and tension in your dog. Just as important as exercising your dog’s body is exercising their mind. By surprising your dog with puzzle toys with food and treats hidden within them or making them “hunt” for their kibble around your house and yard, you are providing he or she with just the right amount of mental stimulation necessary to decrease stress and create appropriate outlets for them to release some of their energy. With a well-rounded regimen of proper diet, rigorous exercise, ideal sleep conditions, and plentiful play time, your dog will enjoy the best possible health. Instead of treating an anxious dog with anti-anxiety medication, consider using a natural supplement. A recent study by Colorado State University found that among those with an opinion, 83.2% of Canna-Pet® customers reported that our hemp products relieved their pets anxiety a moderate amount or a great deal. Instead of treating an anxious dog with anti-anxiety medication, consider using a natural supplement. Butler asked her veterinarian for something that would calm Miles’ anxiety. Her doctor, Angie Stamm, DVM, went with Canna-Pet as a natural remedy for dog anxiety. In order to prevent severe anxiety or fear in your dog, make sure to expose them to a variety of different social situations when they are young. This exposure to different environments with new sights, smells, and people during their formative years will help to decrease the likelihood of fearful behavior as they age.